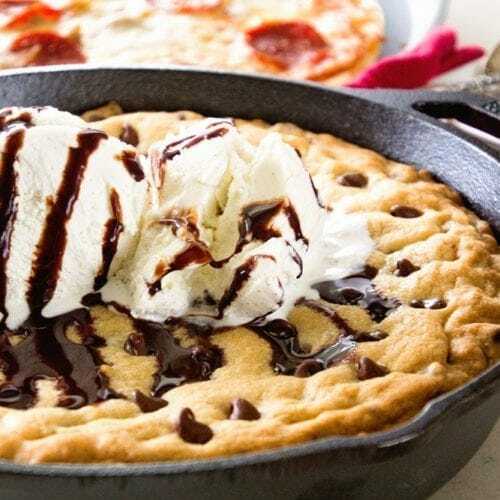 Chocolate Chip Skillet Cookie Recipe ~ This Cast Iron Skillet Chocolate Chip Cookie Recipe is the BEST Dessert! Perfectly Gooey in the Middle and Crunchy on the Outside. Whip up a Batch Tonight! Disclosure: JACK’S Pizza has compensated me for my time to create this recipe. Thank you for supporting the brands that make Julie’s Eats & Treats possible. All thoughts are my own. As I get older and ponder the memories of when I was younger, sometimes I build those memories up. Make them a little bit better than they ever really were. Do you do that too? Then when you experience it again you are totally let down. It’s quite disappointing! A few weeks ago I had the chance to “re-live” one of those memories. I had the chance to go “back” to the Minnesota State Fair, fondly referred to as the “Great Minnesota Get Together”! Isn’t that the truth! There were over 250,000 people there on Sunday of Labor Day weekend, the day we went. It’s quite mind boggling when you think about it. Of course, being the “Great Minnesota Get Together” we ran into my brother’s best friend and his wife. I couldn’t believe it when someone shouted our names amidst the crowd! When I was in my teens I got to go to the State Fair with 4-H. I went a few times to show sheep and once with a science experiment project. After a few times there you get your groove down and know exactly where and what is your favorite things to do, and most importantly your favorite things to eat! 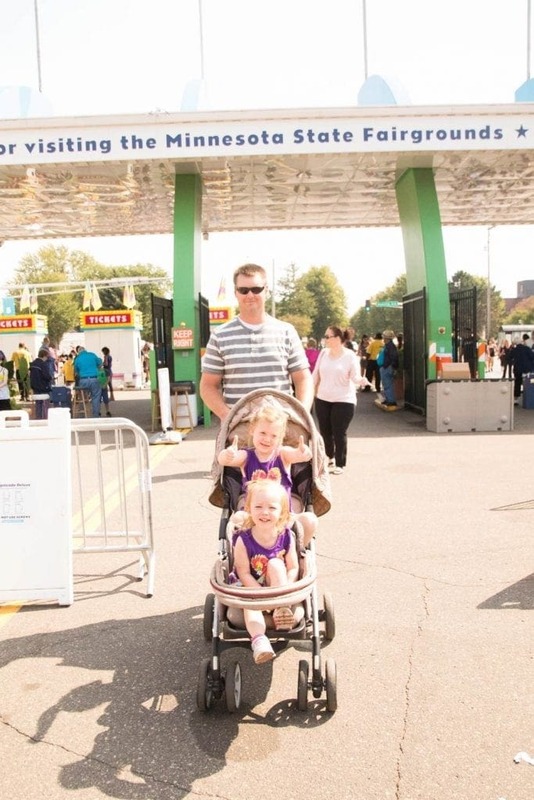 This time I brought my family with and introduced them to the Minnesota State Fair and all things grand about it! First of all, how has my husband never been to the State Fair. If you live in Minnesota it seems like it’s a passage way into adulthood! 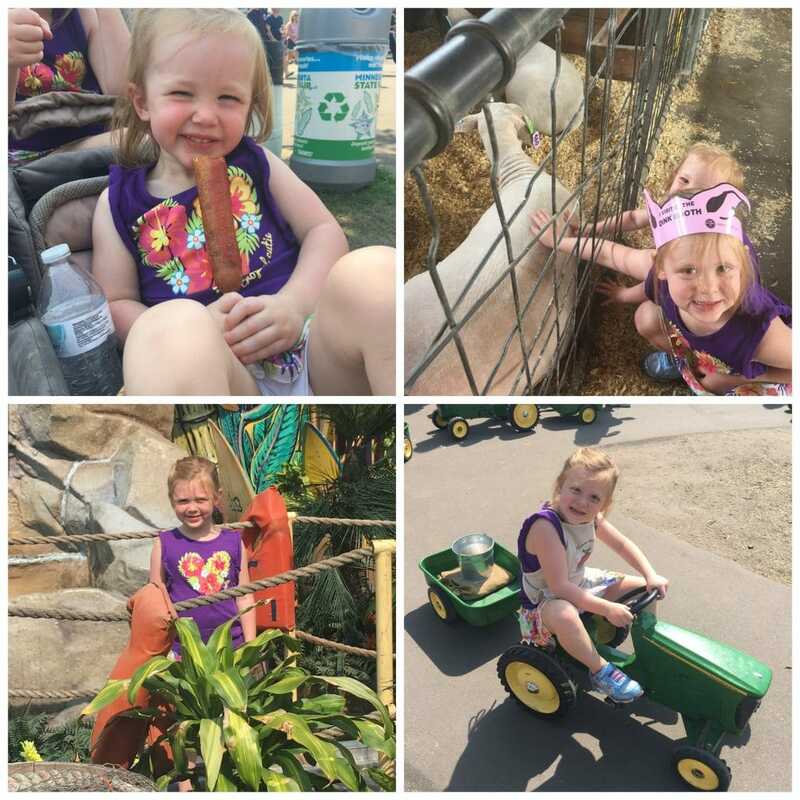 The kiddos loved the rides and of course the barns! It brought back so many memories for me and showing animals there. I kind of missed it, which I never thought I’d say. My husband has informed me my children aren’t showing animals or being in 4-H. We will see who wins that battle! This time I got to experience something new with my family! I got to take in the Amateur Talent Contest Finals sponsored by JACK’S Pizza. So much talent and it’s great that JACK’S Pizza supports youth talent competitions at State Fairs across the Midwest! They have supported the Amateur Talent Contest in Minnesota the last two years and will continue to till 2019, so mark your calendars! Can you say talented? I can only dream of having an ounce of that talent! From pianists under 10 to dancers to quartets and soloists! They left me in awe. 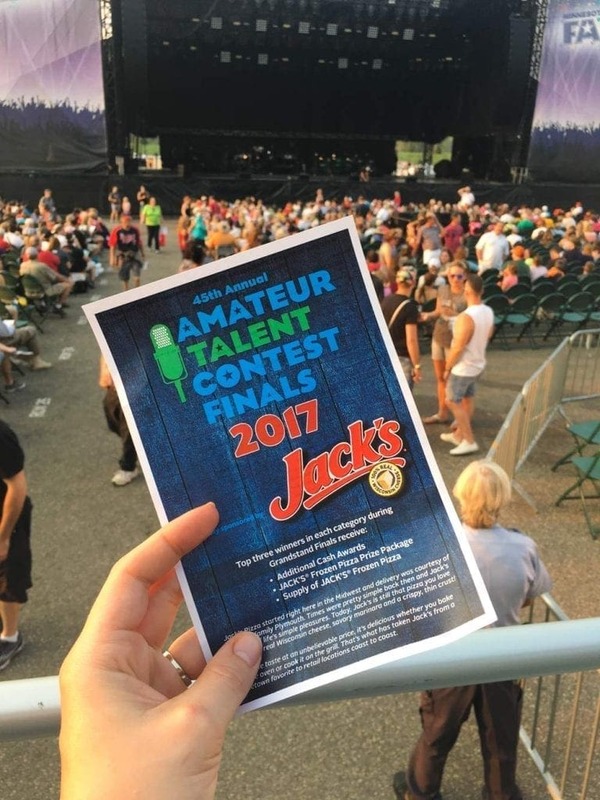 If you ever have the chance to take in the Amateur Talent Contest Finals sponsored by JACK’S Pizza I urge you to do it! Miss K and Rylin even loved it. One of their favorite things to watch on TV is talent shows so they were pretty excited to take in a live talent show! As the grandstand filled up you can feel the excitement in the air! I can’t imagine the nerves the performers had, but you would have never guessed it. They all came out with confidence and poised. Then blew us all away! Our trip was our last hoorah before school started. Now it’s back to the bustle of activities and schedules that come along with the school. It comes crazy faster than we think it will all the time doesn’t it? During the craziness you can often find me reaching into the freezer for a JACK’S Pizza to gobble up before we are onto the next event. My kids love them and so do Mom and Dad, so it’s a win in all categories. Not only do I love the fact that JACK’S Pizza is convenient and a great-tasting mealtime fix that can be cooked in the oven or on the grill. By the way, have you tried pizza on the grill before? If you haven’t then I urge you to. 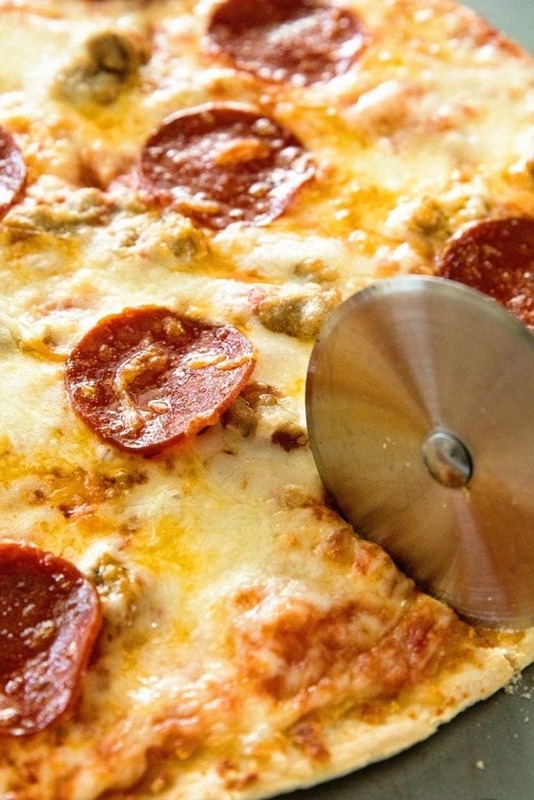 It’s quickly become our favorite way to make JACK’S Pizza. The crust is perfectly crispy just the way we love it! I also love the story behind JACK’S Pizza! It all began in a small Wisconsin town in 1960 in a family garage with simple ingredients and real cheese. I love that they still use quality ingredients, like 100% real Wisconsin cheese, savory sauce and family favorite toppings! It’s still the Midwest’s favorite frozen pizza today. No wonder JACK’S Pizza is loved by Mom’s everywhere and it comes at a honest price. We all love that, right? As always, “JACK’S got your back”! I love to serve a treat for dessert with my JACK’S Pizza. I usually prep it and stick it in the oven while my pizza bakes. Then when we are done eating our pizza we can dig in for dessert! There’s just something about a sweet treat that brings me back to my childhood. I have fond memories of my Mom baking up treats for us whenever we requested! Even when my friends and I requested them at 10 pm. Now that’s a great Mom! As I said before, my favorite part of the state fair is all the food! 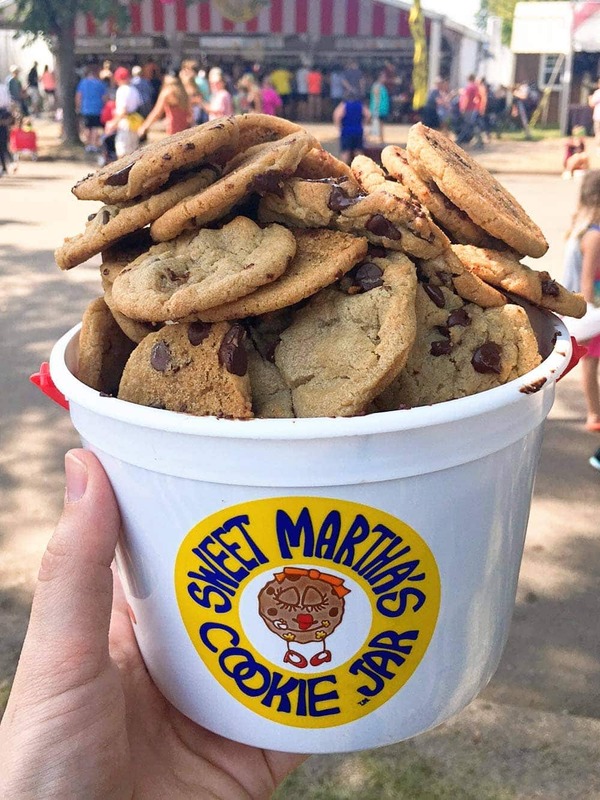 If you’ve ever been to the Minnesota State Fair you know Sweet Martha’s Chocolate Chip Cookies are one of the MUST HAVE things to eat! They are freshly baked and still warm from the oven. They pile your bucket high and they are epic! Seriously, they melt in your mouth! After our trip to the State Fair I was bound and determined to make something as good as those cookies I was dreaming about. Due to the fact I don’t have a ton of extra time in my life I decided a cast iron skillet chocolate chip cookie recipe was the way to go! 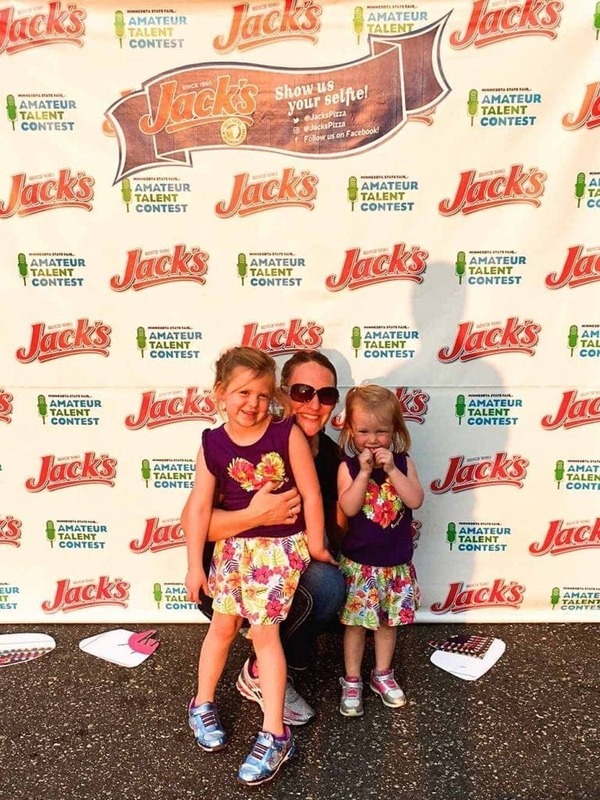 This Minnesota State Fair inspired recipe is my new and improved twist on those Chocolate Chip Cookies I’m still dreaming about from my State Fair trip and it’s the perfect for a sweet ending to your JACK’S Pizza! Plus, I bet you have most of the ingredients in your pantry if not all of them! 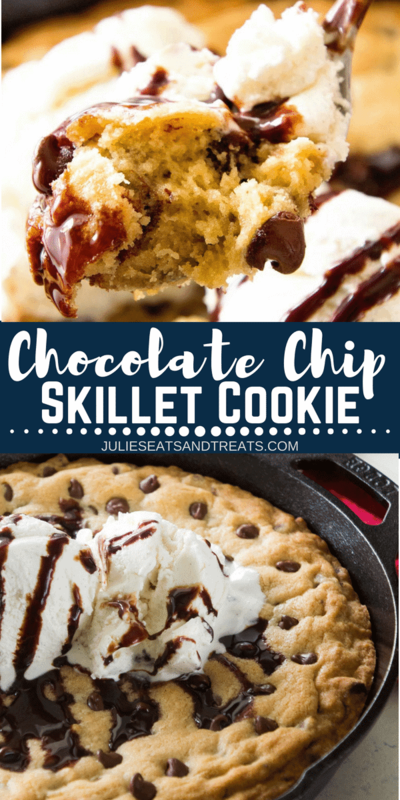 This chocolate chip skillet cookie recipe is my new and improved twist on those delicious chocolate chip cookies I loved at the Minnesota State Fair. 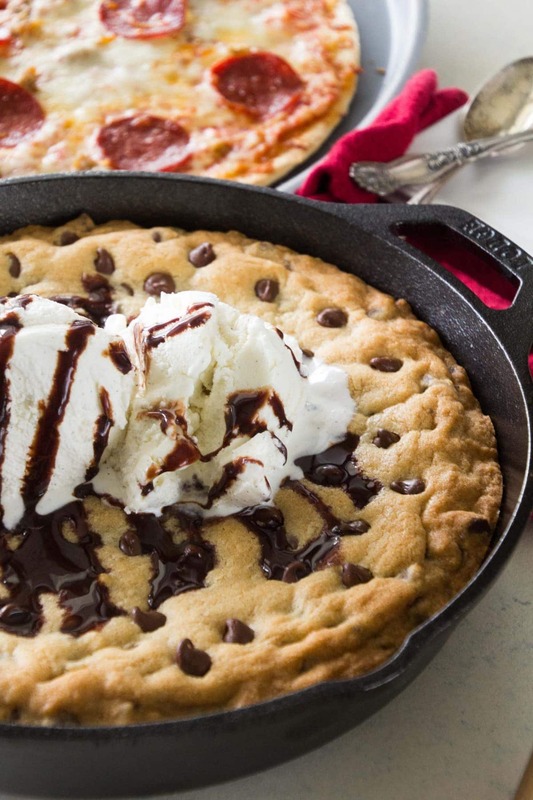 Plus, this skillet cookie is perfect to pair with your favorite JACK’S Pizza. I usually prep the skillet cookie and stick it in the oven while my pizza bakes. Then when we are done eating our pizza we can dig in for dessert! The center is perfectly gooey and the outside is just a bit crisp. Just how I love my cookies. I could have sat down with a spoon and ate the entire skillet cookie, but I refrained. 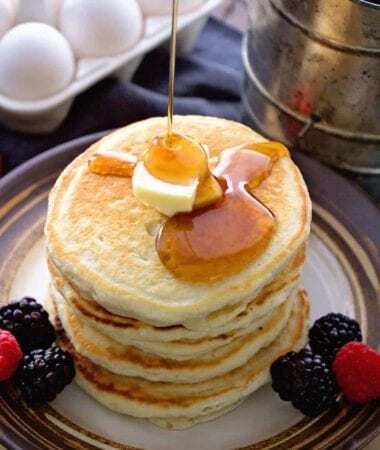 Top it with some ice cream and a little bit of chocolate syrup and you can serve this dessert to your family or guests! They will be singing you praises! 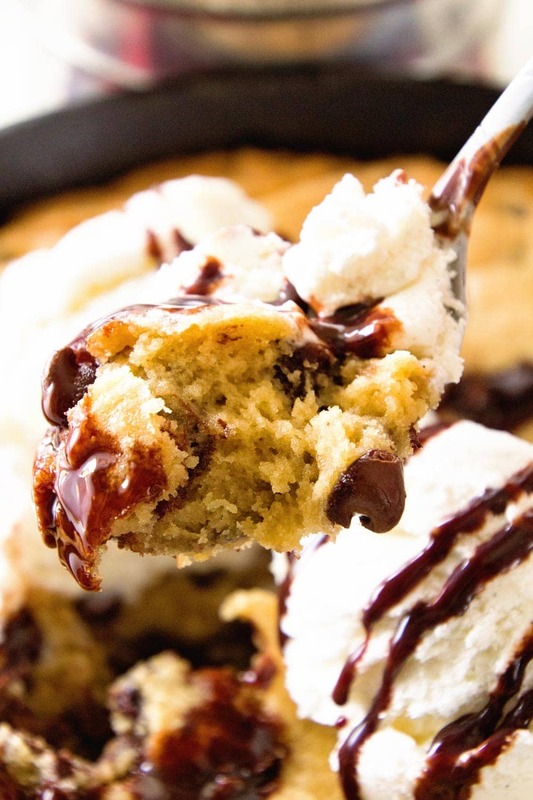 This Chocolate Chip Skillet Cookie is the BEST Dessert! Perfectly Gooey in the Middle and Crunchy on the Outside. Whip up a Batch Tonight! Lightly grease oven-safe skillet. I used a 10'' cast iron skillet. In a large bowl or stand mixer beat butter for 1 minute on medium speedy until butter is smooth and creamy. Add granulated and brown sugar. Beat on medium high speed until light and fluffy. Beat in eggs and vanilla on high speed until completely combined, scraping sides of bowl down if needed. In a separate, medium sized bowl, whisk flour, cornstarch and baking soda until combined. Slowly mix into wet ingredients until combined. Add chocolate chips and stir until evenly distributed. 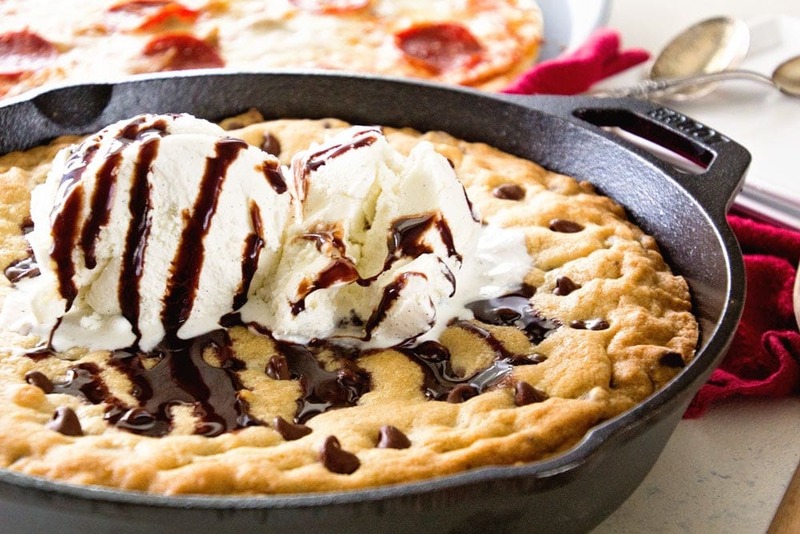 Spread cookie dough into prepared skillet. Baked for 35 minutes or until browned on the edges and light browned on top. Cool cookie for 5-10 minutes and serve. You can top with vanilla ice cream and chocolate syrup if desired. I’m also a follow Minnesotan and love the State fair! We skipped the State Fair this year and felt like we missed out. 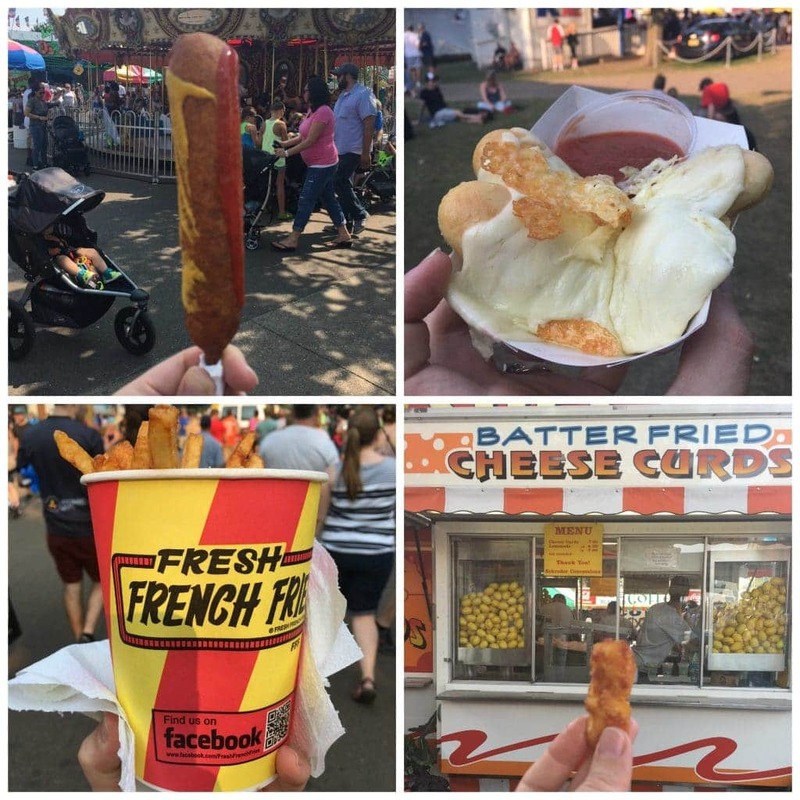 I have to ask, what is the picture of in the top right corner of your State Fair food collage? Looks like cheesy goodness and I don’t recognize it!! 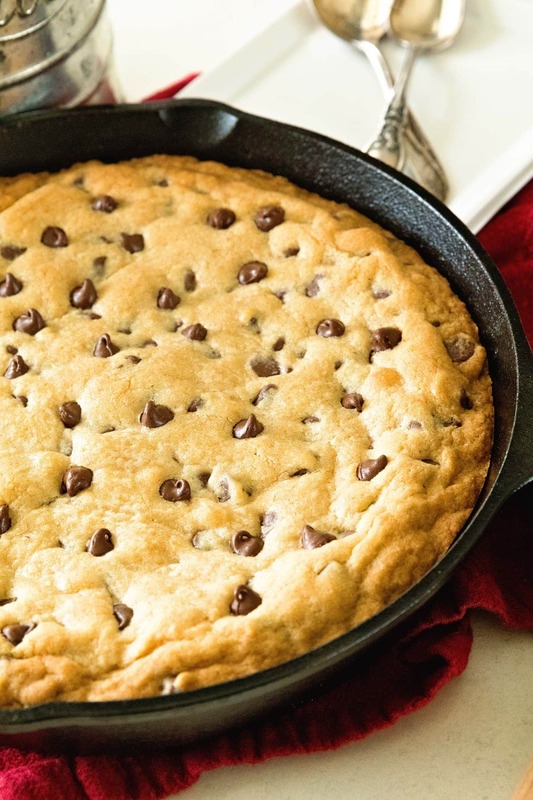 The chocolate chip skillet looks delicious! That’s a funnel cake, with drizzle!! Yum! 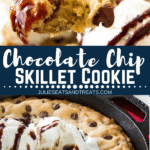 What size iron skillet do you use for this recipe? I used a 10 inch. You could use any size, the baking time would just be different! This is delicious! Followed the recipe exactly. Used a 10 inch cast iron skillet and baked for 35 min. Definitely a keeper! Such a fun dessert to make! So glad you enjoyed it! I used a 10” cast iron skillet.